Pay per click campaigns gives us an additional business opportunity to grow your business. As a top PPC company in Delhi, we create the most structured and organized PPC campaigns to give you maximum results. We provide the best PPC services in Delhi by focusing on ROI driven campaigns. It is the most cost-effective mode of marketing this involves promoting your products or services through various search engines. As a top pay per click advertising agency in India, we always try to keep consistent conversion rates. With Google being the most popular search engine running popular advertisements on Google AdWords is the most popular form of PPC advertising. We are a top PPC company in Delhi that closely works with PPC experts to understand that which type of campaigns are more suitable for the business that will help in generating a proper ROI. The best thing about PPC ads is that you pay the same or some times lesser than when your actual CPC set by you. As a top PPC advertising agency in India, we always try to aim at higher ad positions at a lesser cost. With our best PPC services in Delhi we always monitor and keep a track record of the campaigns, our dedicated team uses the entire data analytics to strategize the next marketing moves for a particular campaign. Which includes keyword selection, competitor analysis, bid management, ad copies creation and negative keyword analysis. 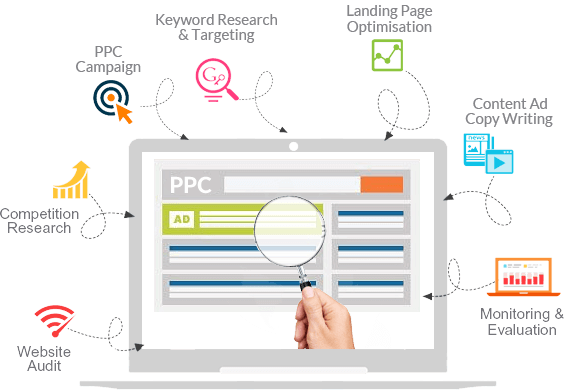 Start working with our PPC team to enhance the results driven from your Pay Per Click Campaigns. Being the best display advertising company we play an important role in creating brand awareness through display/banner advertisements. We follow all the recent industry practices for this we make best banner advertisements for the ads and make a perfect targeting combination so as to reach correct targeting audience for the ads which will play a key role in driving quality traffic and leads. We have specialized experts who do account audit of the entire Adwords account which includes a perfect ad group theming and manage end to end campaigns. Having a good account structure plays a key role in optimizing the campaigns. We use the best strategies to make quality ad campaigns so as to get maximum leads and conversions for the campaigns. We have the performance marketing experts who can improve your businesses ROI. We constantly monitor the landing pages and try testing various variations on the website to maximize your conversions. We also track the performance of your ads through A/B testing. This technique helps to understand which variations work for the brands. This process involves showing ads to those people who have already visited your website. We have experienced marketing and technical experts who have hands-on experience in managing to remarket with the remarketing tag code on the web pages so that the tag gets active whenever the visitor visits your website. We show relevant/dynamic ads campaign to people who have visited your website which plays a key role in boosting the conversion rate of the campaigns so that the previous website visitors can engage with your businesses. We share in-depth detailed reports of the performance of the campaign as a part of PPC management services. We are always focused on maximizing the ROI of the ad campaigns after taking an in-depth analysis from the report we manage and optimize the campaign regularly. Performance data is driven by many factors like clicks, impressions, CTR and ROI.